Declan is a native of Antrim town, and a son of the late veteran civil rights activist Oliver, and Brigid Kearney, nee Totten. He has deep personal roots in and widespread family connections across South Antrim. A lifelong Gael, he played football and hurling, and participated in Scór, on behalf of Kickham’s Creggan. As a fluent Gaeilgeoir Declan has promoted and taught Gaeilge throughout southwest Antrim. He is a father of two, and his own family is bilingual. He has a strong background in community economic development and local campaigning. Declan has been active in republican politics since 1980, and is a former Sinn Féin County Antrim organiser. He has been a key member of Sinn Féin’s national leadership since 2003, and has previously served as the Party’s northern Chairperson and deputy General Secretary. 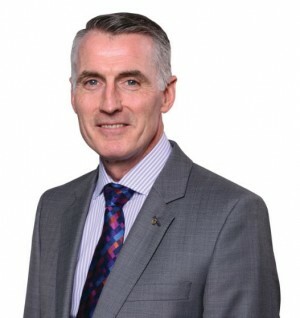 Currently he is the Sinn Féin National Chairperson and has been central to the Party’s all-Ireland development, and its negotiations and reconciliation strategies.